vertical perforated cylinder and an open or perforated base, which provides maximum infiltration area. Soakwells in Perth are very effective in sandy soils. They are easy to construct. They allow runoff to soak into the ground in the same area it would have prior to urban development, rather than being conveyed away. They can be installed after an urban development has been established. In Perth, the soakwell size will depend on the soil type, particularly its infiltration capacity. Perth's groundwater levels need to be considered when determining the depth and design of the system. The base must be above maximum or controlled groundwater level. Installation will be more difficult if rock or other hard material is present. Prevent mosquito breeding by adequate design. In Perth, there should be no water ponding in soakwells after 96 hours between November and May in the south-west of Western Australia and throughout the year in the north. Sediment control is recommended, particularly during road and lot development, to prevent blockage. Stormwater is rainwater plus anything the rain carries along with it. Stormwater in Perth can be considered a valuable resource. Its re-use leads to water savings and reduced environmental impact. Soakwells in Perth assist in this process. In Perth's urban areas stormwater is generated by rain run-off from roof, roads, driveways, footpaths and other impervious or hard surfaces. In Perth, Australia the stormwater system is separate from the sewer system. Unlike sewage, stormwater is generally not treated before being discharged to waterways and the sea. Poorly managed stormwater can cause problems on and offsite through erosion and the transportation of nutrients, chemical pollutants, litter and sediments to waterways. Stormwater is a useful resource that can replace imported water for uses where high quality water is not required, such as garden watering. > Avoid cut and fill on your block when preparing the building foundations. Attempt to maintain the existing topography and drainage pattern. > Retain vegetation, particularly deep-rooted trees. These lower the water table, bind the soil, filter nutrients, decrease run-off velocities, capture sediment and reduce the potential for dryland salinity. > Detain stormwater on your block where practicable through use of permeable paving, pebble paths, infiltration trenches, soakwells, lawn, garden areas and swales and soakwells, in Perth. > Reduce erosion potential on site during building works by minimising the time that land is left in an exposed, unstable condition. Employ sediment traps and divert clean stormwater around the disturbed site. > Minimise the area of impervious surfaces such as paved areas, roofs and concrete driveways. > Grade impervious surfaces, such as driveways, during construction to drain to vegetated areas. > Harvest and store roof water for use. > Take care with the substances you use on your land as they can end up in the stormwater. Do not over-use fertilisers, herbicides and pesticides follow the manufacturers instructions regarding amount and frequency of application. Look for organic alternatives. > Avoid the use of solvent based paints. When using water based paints, clean brushes and equipment on a lawn area to trap contaminants before they reach waterways. Plant based paints are the most environmentally benign. > Do not build on flood plains as the land may be periodically subject to inundation and may possess a high water table. Councils can advise on the 1 in 100 year flood level. The traditional stormwater management response relied on conveyancing. Water was conveyed by a pipe or channel from a collection area to a discharge point. The collection area is your house or street and the discharge point is the nearest ocean, creek, river or lake. The conveyancing system sought to remove the most water (high quantity) from a site in the shortest time possible (high velocity). Large, impervious paved areas and big pipes are typical of conveyancing. The traditional system of conveyancing is highly effective in reducing stormwater nuisance and flooding on site, unless the pipes get blocked. but merely transfers it to the other end of the pipe and ultimately upsets the local water balance. Stormwater is carried rapidly with its suspended litter, oil, sediment and nutrients and dumped in an ocean, river or lake. The receiving water body then becomes flooded and temporarily polluted because all the stormwater arrives at one time. 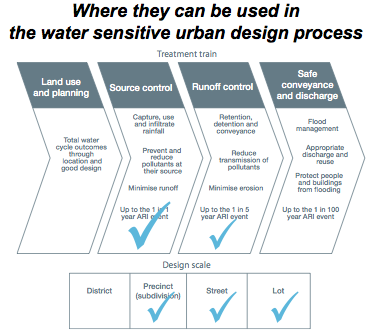 Water Sensitive Urban Design seeks to approximate the natural water balance on-site prior to the land being built on. It achieves this by slowing the water velocity of stormwater run-off, providing natural filtration, on-site detention and infiltration. The water eventually reaches the river, lake or ocean but has been cleaned and filtered by the soil and used by plants before it gets there. The objective is to minimise impervious surfaces so that the least amount of water flows off-site into the stormwater system. At the scale of the individual household, options such as permeable paving on driveways and footpaths, garden beds designed for infiltration (raingardens), lawns and vegetation, swales and soakwells can detain stormwater and increase percolation into the soil. In some cases it may be advisable to place perforated pipes beneath the infiltration areas to direct excess stormwater to the stormwater system. See the references at the end of this fact sheet for more details about options and possible designs. and decreases water bills. Erosion and the downstream effects of stormwater pollution on nearby rivers, lakes or ocean are reduced. Check the soil type. Sandy soils are excellent for infiltration but clay soils tend to become waterlogged. This will affect the efficiency of some of the water sensitive design solutions. For example, water sensitive design in heavy clay soils may need to be supplemented with traditional conveyancing methods. Soil depth ensure that you have sufficient soil depth. Areas with shallow soil underlain by impervious rock such as granite, shale or limestone may impede infiltration and may require some stormwater pipes to remove water for discharge off site. groundwater determine the depth to groundwater. A high groundwater table may reduce the effectiveness of infiltration methods during storms. Slope ensure that the stormwater design accounts for the terrain as severe slopes increase run-off velocities. Ensure there are no illegal cross connections of sewer and stormwater drains. This is where the stormwater drain discharges into the sewer system and can cause sewage overflows on your property during heavy rain. Prevent rain from washing sediment (eg sand, soil) into stormwater with a roof, tarpaulin or awning. Downstream environmental benefits of stormwater design and reduced pollution in Perth, WA. > Soakwells make rivers, lakes and beaches will be cleaner and safer for swimming. > Councils will need to spend less money emptying stormwater traps if soakwells in Perth are adequately installed. > The environment will be healthier for plants and animals in perth, Wa if soakwells are recommended and installed when appropriate. Llyod S, Wong T and Chesterfield C (2002), Water Sensitive Urban Design A Stormwater Management Perspective, CRC for Catchment Hydrology, Industry Report. Mobbs M (1998), Sustainable House: living for our future, Choice Magazine, Sydney.